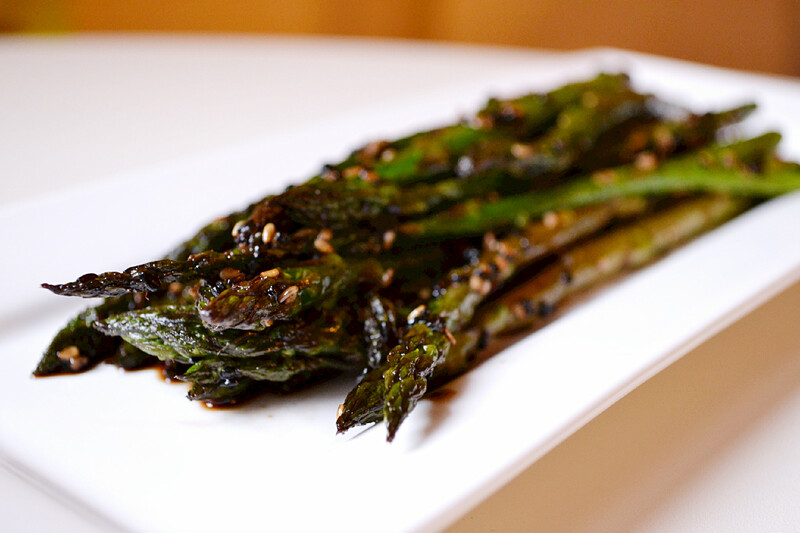 Asparagus is one of those vegetables that I love, but only when it’s done right. I can’t stand to eat it overcooked or boiled and mushy. It has to stay somewhat crunchy and firm. How I chose to cook asparagus also depends on the type of asparagus I’m using. It’s available in green and white, thick and thin/baby spears. I have yet to try cooking with white asparagus, and I generally use thick or baby green asparagus with a slight preference for the thin/baby variety. While they all taste relatively similar, there are slight differences, most importantly texture. 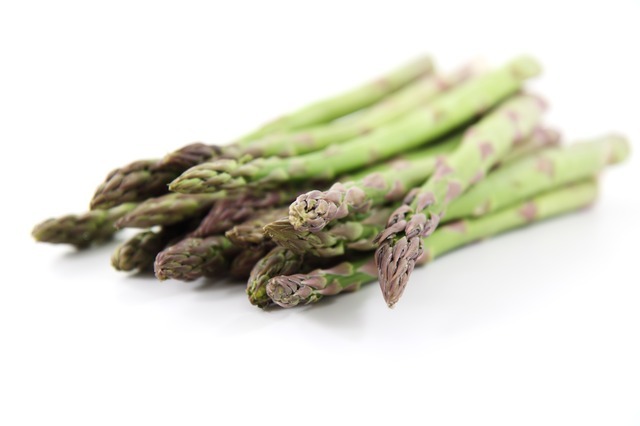 The thick asparagus cooks up “meaty” in texture and I generally prefer steaming or simmering it. Sometimes I steam it lightly and serve it topped with a pinch of sea salt and fresh ground black pepper or drizzled with Mama’s Lebanese Salad Dressing, Since the stems are a bit rough, it’s important to snap off the woody ends by bending the asparagus a few times until it snaps off naturally, usually near the bottom of the spear. You can then scrape the bottom of the stems with a vegetable peeler to remove the roughness. 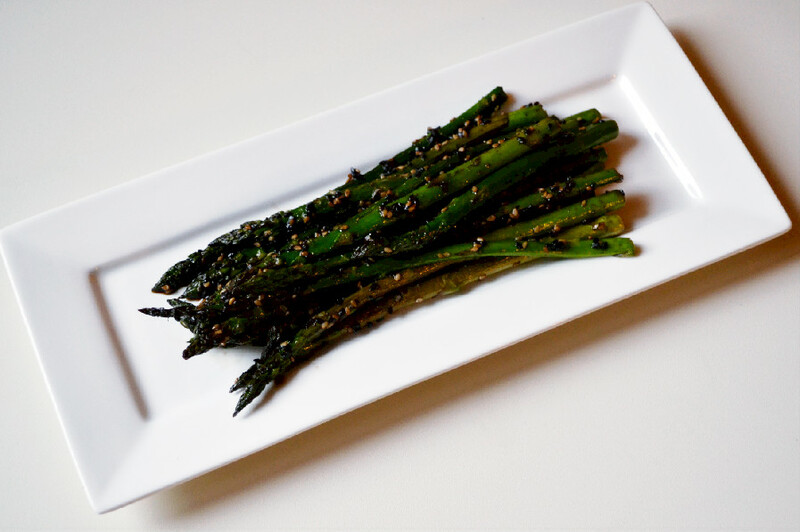 The thin or baby asparagus is more tender and crisp, lends itself well to sautéeing and cooks relatively quickly. I like to sautée it in a wok like I did here with sesame oil, garlic, soy sauce and sesame seeds. I usually just trim the very woody ends at the bottom, but peeling is not necessary as the spears are quite tender. Either variety makes a great addition to risotto, pasta and other grain dishes (like here in this Spring Barley) and is also great grilled on the barbecue. If you are adding them to a recipe, remember that the tips cook more quickly then the stems, so I like to add them in phases. Today, I’m sharing a really simple yet tasty side dish or appetizer that makes great use of this seasonal vegetable. Heat sesame oil (or water for oil free) in a wok or skillet over medium heat. Add pressed garlic and sauté for 1 minute. Add asparagus (washed and trimmed) and toss to combine with oil and garlic. Add sesame seeds and toss to combine. Sauté for 2-3 minutes over medium heat. Add 1 – 2 tablespoons of water, cover and simmer for 2-3 minutes. Uncover, add 1 – 2 tablespoons of shoyu or tamari (depending on how strong you like the flavour) and toss to combine. Continue to sauté about 3-5 minutes for a crisp and tender texture. yum this looks delicious! I loooooove asparagus. I love em’ too! Let me know how you like it if you try this out. Thanks for stopping by. By the way R.P. Apothecary….just read your blog and love your tip for unfed sourdough starter. I never know what to do with it. I’ll have to try out your Sourdough Muffin recipe. I would have left this comment on your blog, but I couldn’t find the comments section…am I blind? You have a wonderful food blog so…I’m sending you…. Thanks D! I’ll be sure to check it out.